I love chili. It’s spicy, filling and a giant bowl full is perfect for hunkering down and getting cozy. It’s comfort food so there’s no need to get fancy with anything. 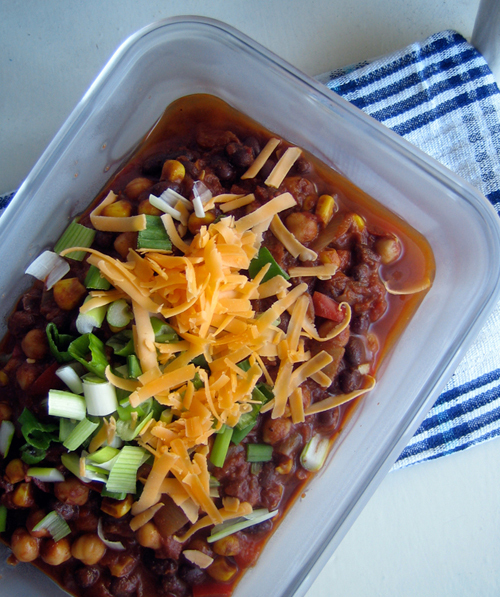 When it comes to chili recipes, I feel that I’ve found one that’s true to my heart (though now instead of ground chicken I use veggie ground). But occasionally, my eye wanders and a new chili recipe lands into my lap. A little while ago, I spied a spicy bean chili recipe over at Dana Treat and decided to try my luck with it. A total win! I did make a few changes because I just couldn’t seem to give up my love of chocolate in chili, so in went a couple of chocolate chips and I upped the spice factor. It was a very good move. Dana mentions that it’s good form to chop up all vegetables to be relative to the bean size – no large chunks. So I followed that rule and I think you should too. Not only does it make it so that you get a good bite of everything, but it just makes everything look a bit nicer. And when you’ve got a bowlful of brown, things should look pretty good. If you want to deepen the flavour, let the chili cook longer (the spices will intensify). In a large pot, heat olive oil over med-high heat and saute onions and garlic until soft. Add in spices and red pepper and mix everything around until fragrant. Add in tomatoes, chipotle, water, beans, corn, and chocolate chips, and let simmer for about 30 minutes. Serve in bowls with your choice of toppings. 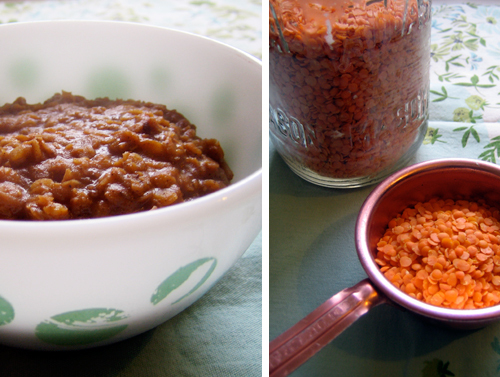 You can find me over at ReadyMade dishing on that pantry staple: red lentils. Not only is there a short briefing on the joys of pantry cooking, but you’ll be presented with a pretty fine recipe for a simple and easy red lentil dal. Let me add that the recipe is so good that after my first bite I said “motherf*ck” under my breath. Yup, I’m dropping it like it’s hot. It was that good. So go. Go now. « why hello there & welcome to my new home! Mmm, this looks good. I love chili but it always ends up just being a vehicle for cheese and sour cream. Oops. I tried Dana’s chili too! It was fantastic! I loved the smoky heat the chipotle peppers in adobo gave it. I recently made chili and forgot about how I wanted to try it with chocolate. Glad to have your affirmation on it. I love a good chili and have definitely heard that tidbit of advice about cutting everything the same size before. It’s true for pasta dishes as well! This chili looks delicious. I love that you added chocolate to it. Key move. Had 3 Bean Chili at a Specialty Bakery in Seattle yesterday…. never again! Thank you, oh thank you for the perfect timing of this post! Now I will not have to rely on steel tubs and crusty ladles for my chili lunch. Looks delicious! I love chili. Congratulations on your new cyber home. I love your blog. 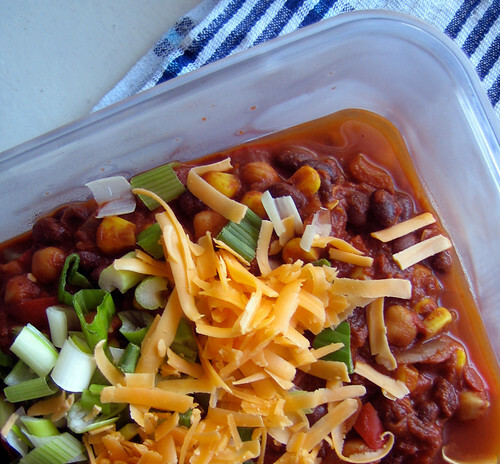 Your new blog home looks great, as does the chili! If you and Dana are both endorsing this dish, I’m totally in. Sounds fabulous! Congrats new domain from Poland!!! btw: great recipe! Chili with semi-sweet chocolate chips? I’ll have to try this. It looks so good! Your new digs are tres swanky! Everything looks beautiful and clutter-free. Good job. The chili looks wonderful. I’ve never tried putting chickpeas in chili. It sounds tremendous, but I’ll have to wait to try it because I just made chili for dinner last night. Popped in to say hi! You can’t ever go wrong with chili! Chocolate chips are a great idea! Thank you so much for the mention, sweet lady. I’m TOTALLY trying the chocolate in there next time. Why didn’t I think of that?? Allie, I understand the sour cream/cheese vehicle. Never a bad thing, really. Yes, glad you loved it, Jacqui. She’s a good one that Dana! Bijoux, me too. I always feel like something is missing. Cocoa is important. Smoky paprika should be easy enough to find in a city like Toronto! Head to an ethnic market or a gourmet food shop. Sara, chocolate and chili are best friends. Joanne, agreed about pasta dishes as well. Crusty lady chili should be a no-go zone after this, Sprout. Buttered bread sounds perfect for dipping, Tracy! I’m in. Thanks Lisa, Mrs L, geek+nerd & przepisy! It’s a great chili, redmenace! Jen, once you try it you won’t go back. Hooray, thanks Briana for taking that extra step! Definitely true words, Blond Duck. Dana, the chocolate is a mighty fine addition. Try it!